In the spring of 2014, rancher Cliven Bundy and his armed supporters engaged in a standoff with Bureau of Land Management agents, and once again, the federal management of public lands was in the national spotlight. The conflict arose because Bundy had not paid required grazing fees and a federal judge ordered the confiscation of his cattle. The ensuing media coverage highlighted information that may have surprised those outside the rural West: the federal government manages 640 million acres of public land, with over 90 percent of it in the West. 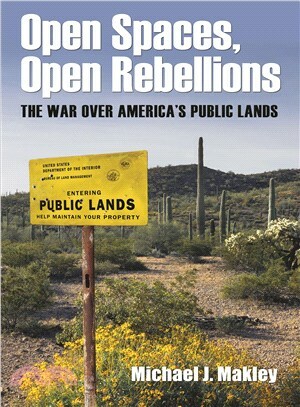 In Open Spaces, Open Rebellions, Michael J. Makley offers a succinct and compelling history of the federal government's management of public lands. As Makley reveals, beginning in the nineteenth century and continuing to the present day, debates over how best to balance the use of these lands by the general public, fee-paying ranchers, and resource developers have always been complex and contentious. Indeed, these debates have often been met with demands for privatization or state control, best exemplified by the Sagebrush Rebellion of the 1980s and the 2016 occupation of Oregon's Malheur National Wildlife Refuge. Michael J. Makley is the author of several books on Western history, including, most recently, Saving Lake Tahoe: An Environmental History of a National Treasure.